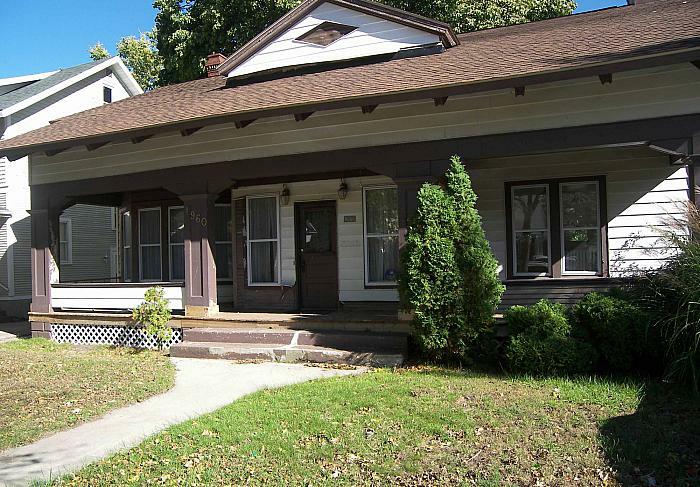 Gerald R. Ford boyhood home at 1960 Prospect Ave. SE. This was the house in which Ford and his mother lived from 1913-1917. The street name, Terrace Ave., was changed to Prospect in 1920. Garfield Lodge, 334 Burton St. 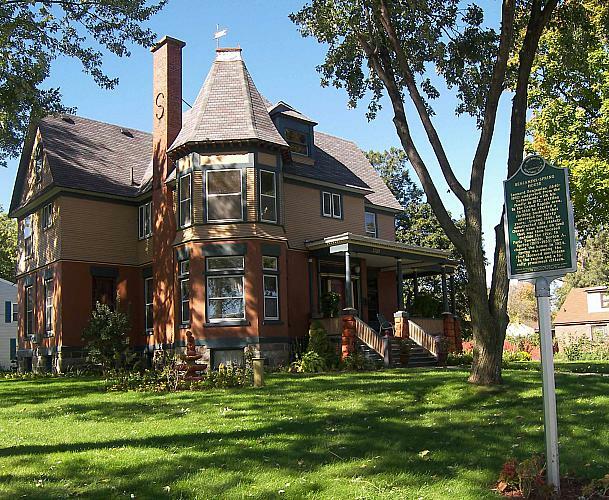 SE was erected with funds provided by Harriet Garfield in memory of her husband Samuel (parents of Charles) as a meeting place for people and societies for purposes of art, learning, and community gatherings. 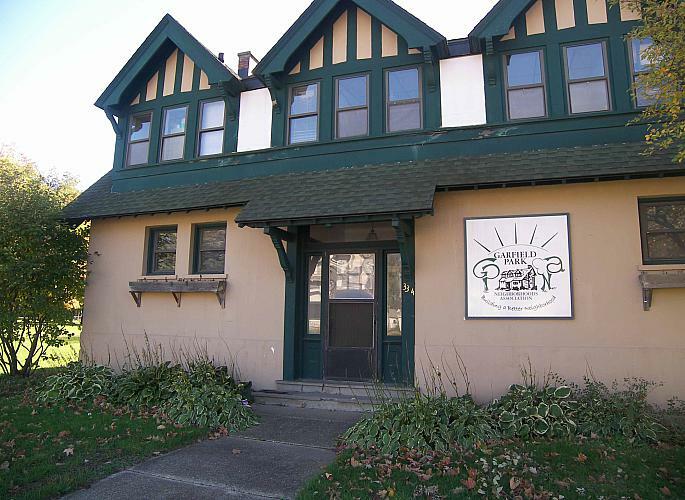 The first floor is still used for community events and the second houses the Garfield Park Neighborhood's Association offices. 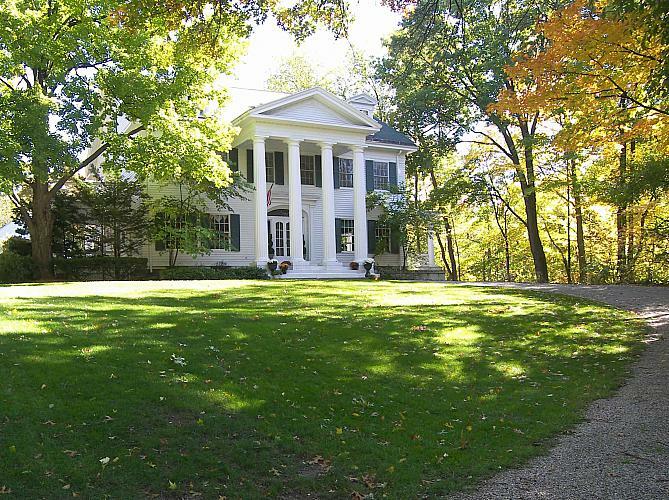 It is on the City of Grand Rapids list of historic places. Garfield Grave, 334 Burton St. SE. After he died in 1934, Charles Garfield was cremated. His ashes were buried at the base of one of the trees he had planted. There is a small marker at the base of a Sycamore Tree (Acer pseudoplatanus). 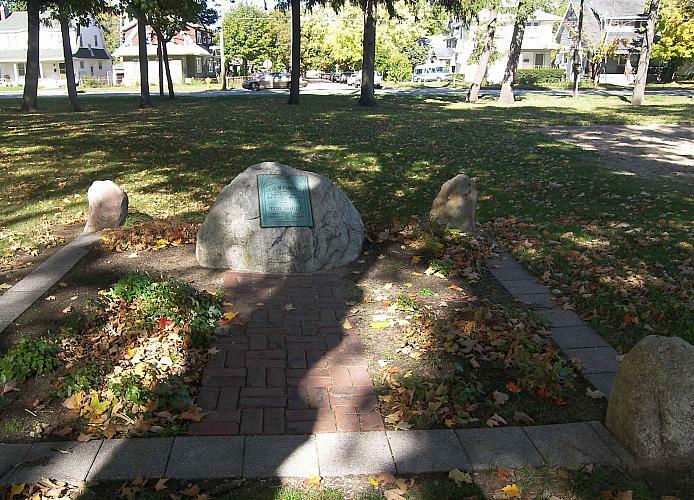 It is located next to the Garfield Lodge parking lot, and directly east of the Garfield Memorial. The marker reads: Memory Tree, Chas. 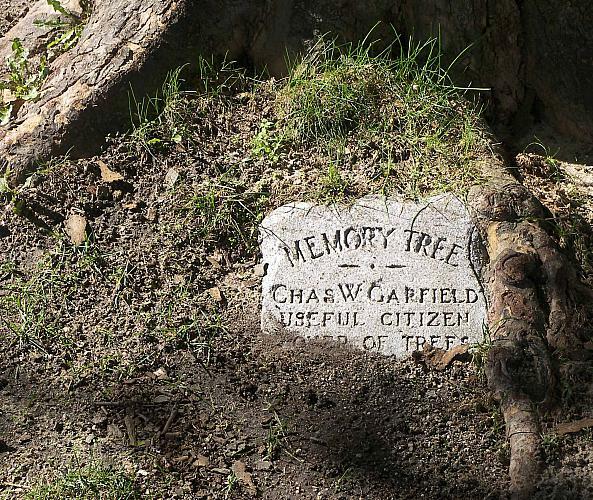 W. Garfield, Useful Citizen, Lover of Trees. Garfield Memorial, 334 Burton St. SE. A large boulder stands west of the Garfield Lodge with a commemorative plaque to Charles and Jesse Garfield. Garfield home, 200 Burton St. SE. 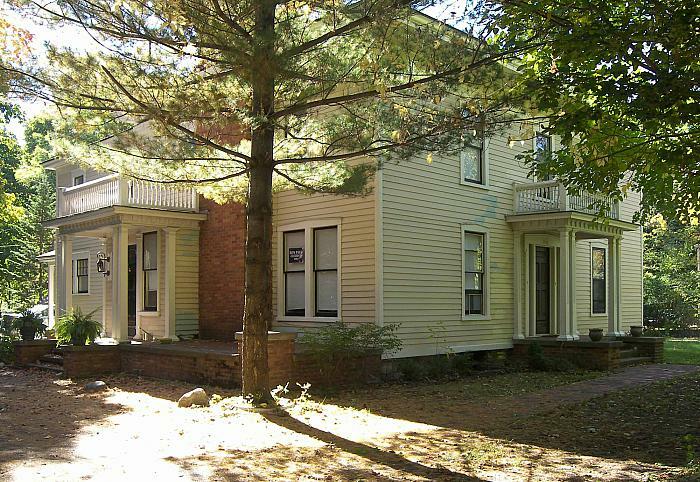 This house, built in 1860, was the Garfield home until 1920. 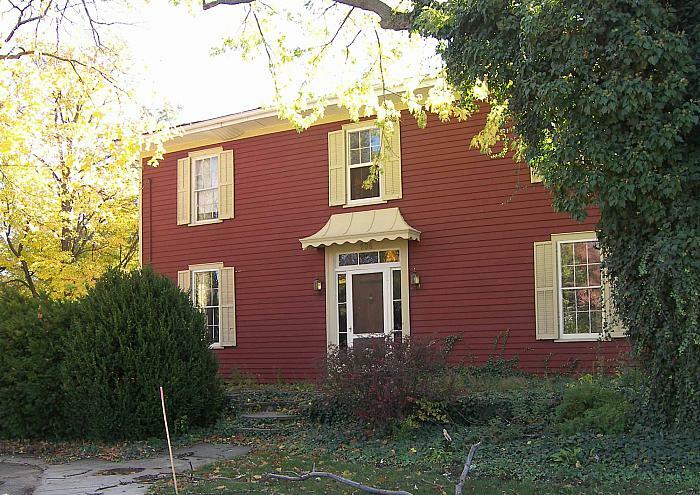 Edward Feakins Home at 247 Burton St. SW., built in 1860, contains 100,000 bricks. Feakins was born in England in 1798 and came to the United States in 1830. He died October 6, 1889. 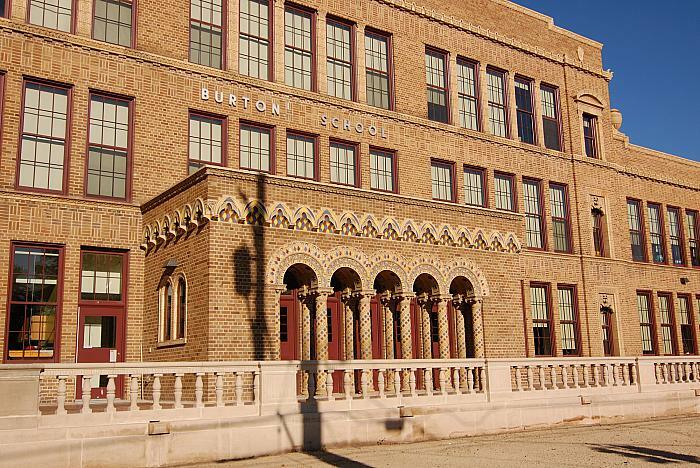 Burton Elementary and Middle School, 2133 Buchanan Ave. SW. opened in 1926. It is celebrated for its doorways completed in the Byzantine style with arches and colorful tiles. This building underwent extensive renovation in 2007 and reopened in the Fall of 2008. Harriet and Barney Burton Memorial, 2510 S. Division. 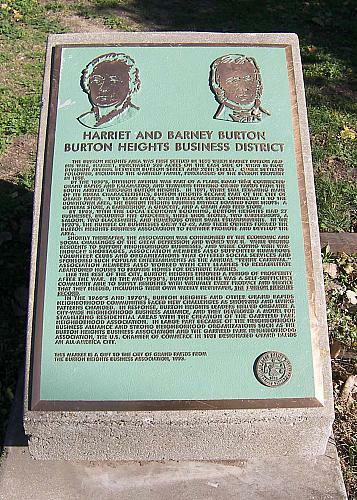 The Burton Heights area was first settled in 1833 when Barney Burton and his wife Harriet purchased 320 acres on the east side of what is now Division Ave. between Burton Street and 28th St. Other settlers followed including the Garfield family, purchasers of the Burton property in 1858. Uhl-Hall home, 512 Overbrook Lane SE. Edwin Uhl was mayor of Grand Rapids in 1890, a prominent lawyer, bank president, assistant Secretary of State in the administration of President Grover Cleveland, and Ambassador to Germany in 1896. His son Marshall Uhl was a prominent lawyer in Grand Rapids. Benjamins home, 2359 Madison SE. This beautiful three story brick home was constructed in 1880 for Leonard Benjamins who owned a clothing wholesale business in Grand Rapids. 304 Alger SE. 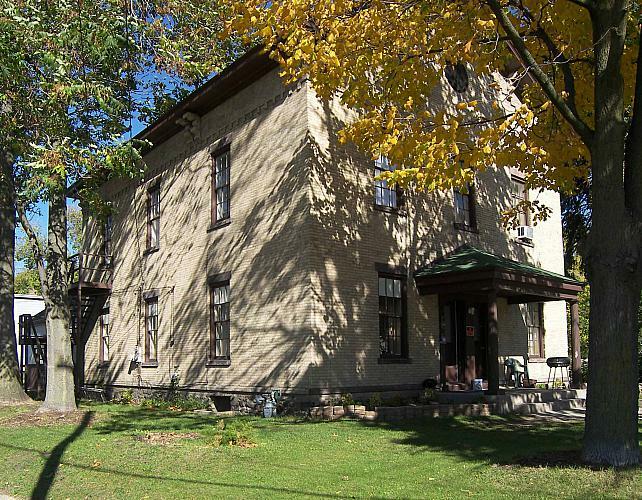 Built in the 1870s, this home was located outside the City of Grand Rapids so little historical information is available. There is a hand cut stone wall across the front yard. Burton Woods, 2259 Everest Ave. SE. In 1892 Charles Garfield set aside six acres of his farm and planted ten species of trees to demonstrate how agricultural land could be reclaimed as woodland. 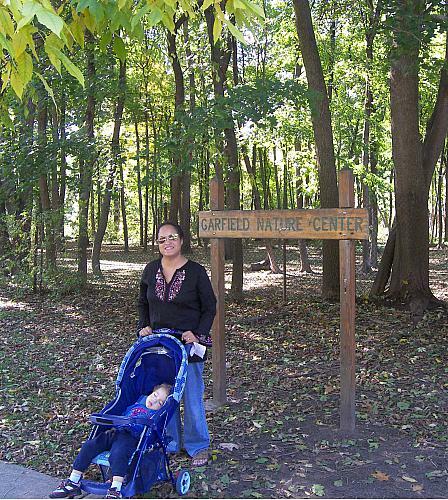 Burton Woods, now known as the Garfield Nature Center is one of Charles Garfield's gifts of green to our city. Nature has filled in Garfield's original plantings to make Burton Woods a quiet oasis in the midst of urban activity. The Nature Center can be accessed from Everest Ave., Jefferson Drive, or Francis St.
Garfield home, 2007 Jefferson Drive SE. 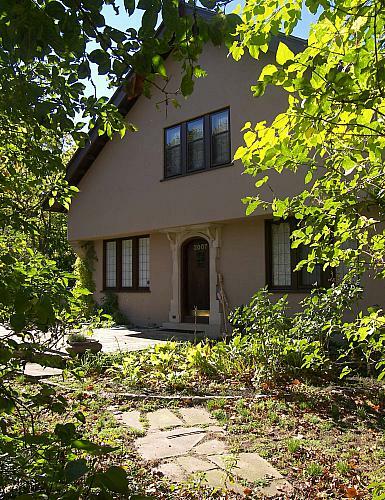 In 1920 Charles Garfield and his wife, Jesse, moved into this home which was owned by his cousin, Julia Fletcher. This was his retirement home until his death in 1934. This map shows the outlines of our historic walking tour of the Garfield Park District. Schroeder, Mary Emily. The Charles W. Garfield Story. Schroeder, 1977. Michigan Tradesman Index--several articles found under, Garfield, Charles W.